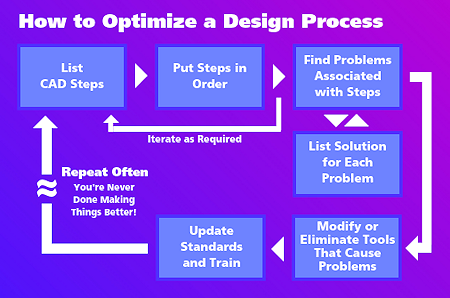 In your efforts to use the right software tools in the right ways, follow this step-by-step procedure for examining — and optimizing — your design processes. In the last edition of the CAD Manager's Newsletter, we talked about the concept of tool worship — a phenomenon that occurs when you conform your design process to the software you use, rather than optimizing the design process independently of the tools involved. The result is a subpar design process and CAD users who fumble along frustrated, repeating the same mistakes and wasting time and money. In this column, we'll have a look at some strategies you can use to keep tool worship at bay — that is, use the right tools at the right times, get rid of the wrong tools, and improve your overall design process by minimizing steps. Here goes. To begin, let's define a disciplined approach to analyzing and understanding your CAD users' needs and tasks, which will be the basis for fleshing out the most efficient design process (with optimal tool use). 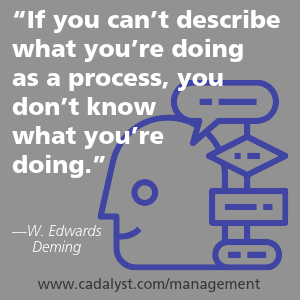 As W. Edwards Deming famously said, "If you can't describe what you're doing as a process, you don't know what you're doing." 1. What are the steps that make up the process? 2. What is the order of those steps? 3. What are the most common problems experienced during each step? 4. What are the best solutions that users have identified for each problem? 5. Which tools can best help to solve each problem? 6. How should our standards and training change to optimize each step of the process? Now that we've outlined the approach, let's get started. • Get everyone together. To identify all your CAD processes and capture the steps involved, you need all the key users and project managers present, right? • Capture the steps. As those in the room identify all the steps of each process, I suggest you act as the facilitator and write down everything on a large whiteboard. • Save the results. As agreement forms on the steps, take care to save the information — or have someone help you do so — by recording the results in a spreadsheet. Don't rely on memory and never assume the whiteboard won't get erased. Autodesk announced the availability of a free 30-day trial version of BIM 360 Design, its cloud-based software for Revit collaboration and data management. All features of the paid product are included in the trial version, the company reports; it requires Autodesk Revit 2018.3 or later to run. BIM 360 Design subscription is $115/month or $900/year. AutoCAD Video Tip: What's Up with That AutoCAD DEFPOINTS Layer? Cadalyst contributing editor Robert Green performs CAD programming and consulting throughout the United States and Canada. He is the author of Expert CAD Management: The Complete Guide.